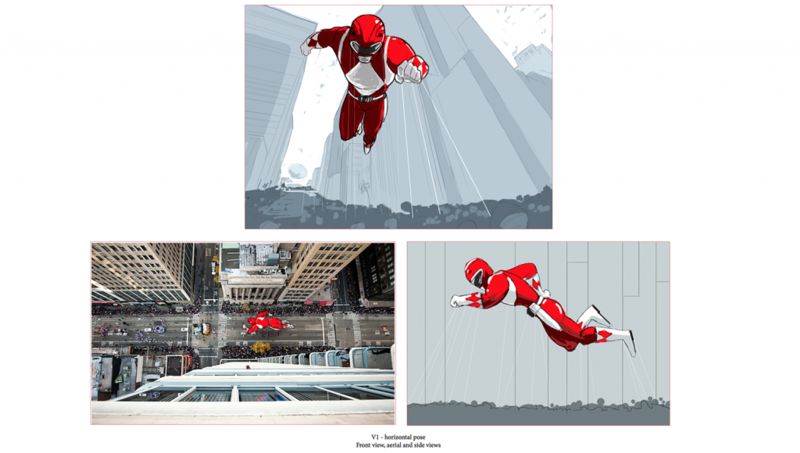 Posted on January 12, 2015 in News, Saban Brands. I work in the very busy Creative Department at Saban Brands and my focus is Power Rangers and kids’ entertainment properties. This is one of those projects that when it landed on my desk early last year, I couldn’t believe I’d been given the opportunity to work on it. Sometimes showing visually that something won’t work, is the only way to prove that it won’t when explanation isn’t enough. 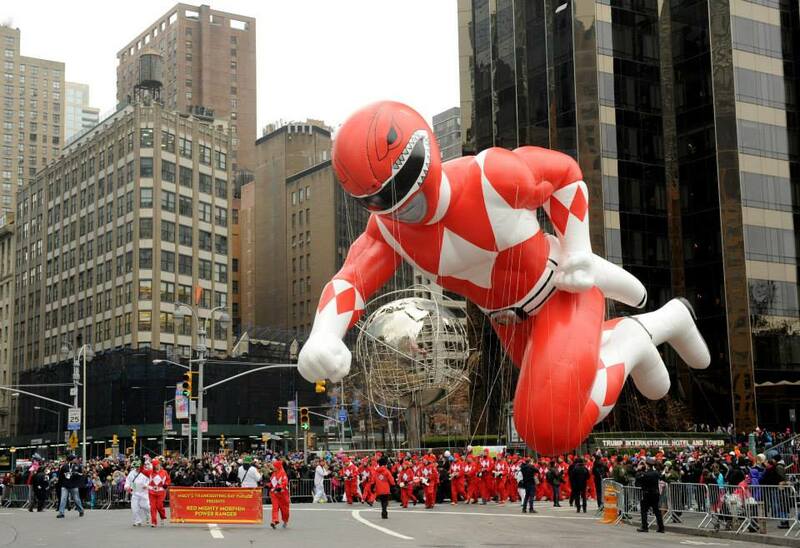 Of course, Macy’s had a team of engineers who would also later consult on the flyability of the designs. 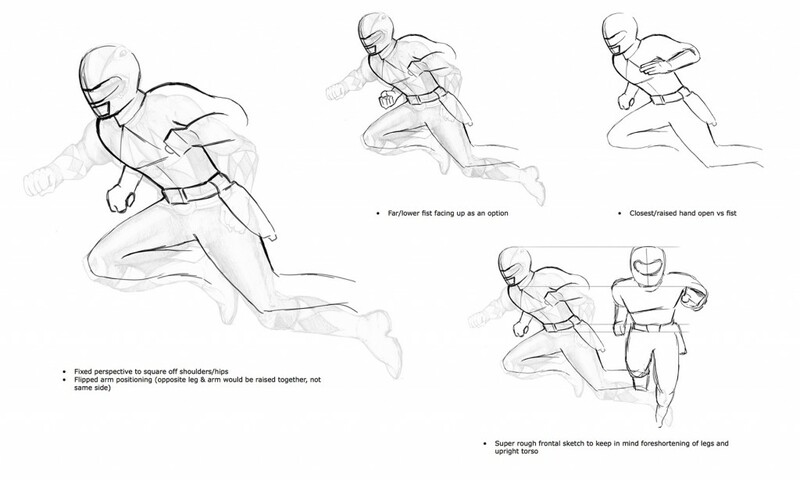 Ultimately a more forward-leaning/horizontal pose was chosen. Macy’s had their own artist do some sketches and I did overlays to help correct the anatomy and pose. After a few more rounds of anatomy and perspective tweaks, and flipping the pose, Macy’s next step was to create a large clay maquette of what the final balloon would look like. This was an interesting part of the process and I wish I had been more involved in this part to work with the sculptor (and even know his/her name!) . The sculpt itself was around 3ft tall! It went through several rounds of revisions, to get Red’s costume just right (or as right as it could be, given the limitations of details when it comes to a creating a super hero balloon!). 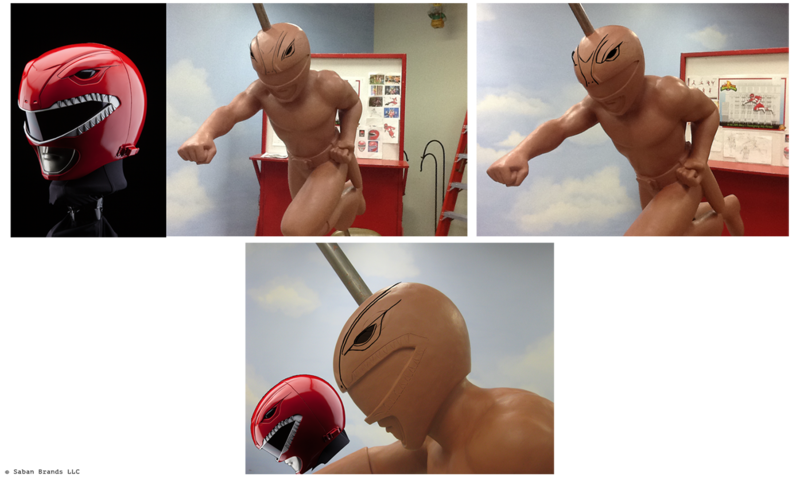 Huge credit to the sculptor, who did speedy revisions within hours, usually less! I did some overlays to correct the helmet. After the clay maquette was approved, it was painted, colors were discussed. The model was then created in 3D software. I’m not sure how this part of the process went, or again, who the artist(s) was/were on their side. Here was an overlay to tweak the helmet. This is an animated gif - if it doesn’t play, click or refresh. I believe after the 3D renderings were done it was then output to the final product of the balloon which was then hand-painted with the precise PMS colors it requires. 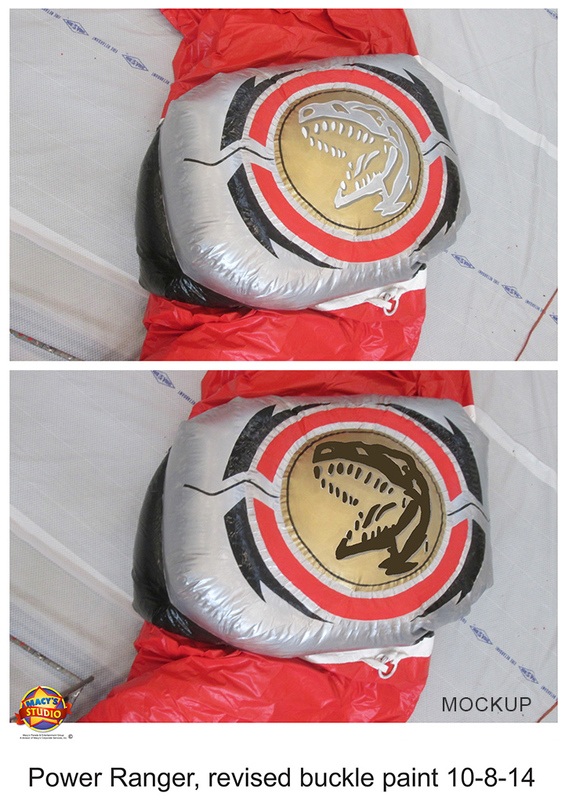 Originally, the morpher was painted grey, and asked them to change it to dark metallic gold/brown color, and did final passes on all colors. I’m sure there are many parts of the process I’ve missed in here, but in the end, I was amazed with the amount of detail they did manage to produce in the Red Ranger. Many many hands touched this project, and countless hours of hard-work and teamwork went into it and in the end, I’m so proud to have been a part of it. 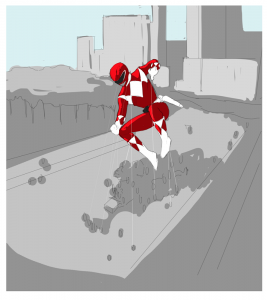 Watching the Red Ranger fly that Thanksgiving morning for millions of people to see, after months of work, and all from a rough sketch – was quite incredible. Separately, I have to mention: it was also a big day for my friend Simon Otto, Head of Animation for DreamWorks, who designed the (How to Train Your Dragon) Toothless balloon (which flew near the Red Ranger!). Go Simon and go Toothless! These balloons, now that I know and appreciate how they are made, have a whole new meaning to me. I hope you’ve enjoyed and thanks for reading if you made it through. Ha! 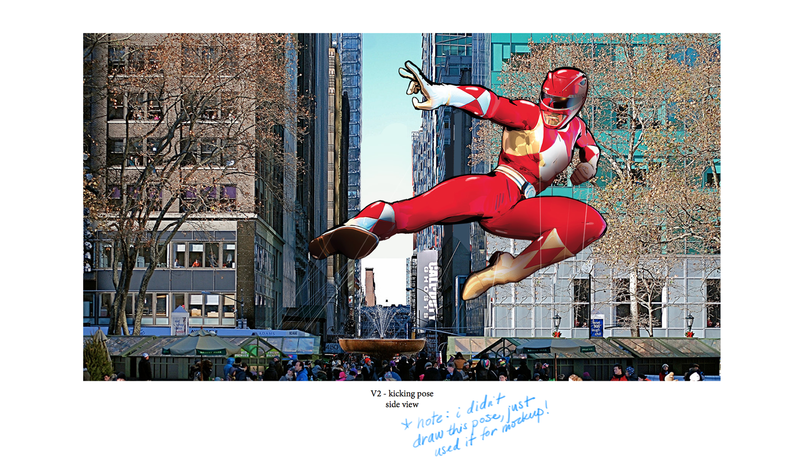 All images and Power Rangers are © Saban Brands LLC. The statements expressed here are my own. Hello, thanks for stopping by. Feel free to send me a note, unless it’s spam. Unless it’s a can of SPAM, then I will love it. Thank you.